DUBAI– 29 September 2013 - Emirates Group Security held its first Aviation Security Symposium on September 24th, creating an important platform for the industry and a key forum for its influential leaders. The symposium, which was a collaboration between Emirates Group Security and the Aviation Security Company Limited (AVSECO) and Edith Cowan University, Perth Western Australia , brought together more than 150 delegates from 22 different nationalities and representatives of the industry’s major associations i.e. Arab Air Carrier Organisation and IATA to present their views, exchange ideas and practices through panel sessions and unique training drills. The topics discussed, over three days, spanned from regulation and cargo security to human factors and technology amongst others. 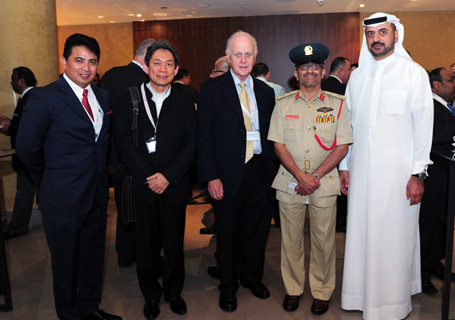 The opening ceremony, which took place at Jumeirah Creekside Hotel, was attended by Major General Ahmed Bin Thani, Director General, Dubai Police General Department of Airport Security, Professor Kerry Cox, Vice Chancellor Edith Cowan University and Aws Al Khanjari, Executive Director of Gulf Centre for Aviation Studies (GCASS). Following this three-day symposium, Emirates Group Security Centre of Aviation and Security Studies (CASS) celebrated its 11th graduation ceremony, conferring 117 diplomas to a diverse class of graduates.